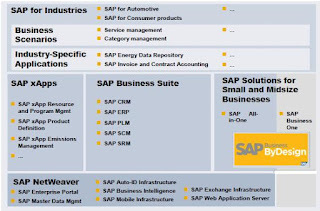 Martin Maruskin blog (something about SAP): No clue between: mySAP BS, ERP, ECC, BBD, A1S, AIO, SBO? Would you be knowing the programming languages used to build SAP business one, and BBD ? Also, is there support for GUI scipting tool similar to the one supported in SAP 640 ? Hi Satya, In case of SBO programming languages: they are all that are supported by Microsoft .NET Framework technology like: Basic family, C family, Java family languages. There is an SDK published by SAP to support programming of add-on for SBO. Regarding GUI scripting support for SBO: I have no knowledge about such a support and I don't think that there is something since extension of GUI can be done based on add-ons for SBO I believe.